Across the chest wear to help stop pulling on the lead. The Balance Harness is a training tool and should be used as part of a training program to reduce your dog’s tendency to pull on lead. The Black Dog Balance Harness helps stop your dog pulling on lead – it helps you train your dog to balance correctly on all four feet and not rely on the lead – They learn to walk comfortably without the need to pull. or Just Connect at the Front, with a normal lead. Easy to Fit and adjust – comfortable and strong. A great Walking Harness, and an effective training alternative for dogs with neck issues, or if a head halter is not appropriate. It’s so easy to order your product today. So to ensure you don’t miss out simply email your order to this address, info@spotdogwalk.com.au, clearly stating your name, contact number and item/s you are after and we will do the rest! It’s that easy. Do not use this Balance Harness to tether your dog. Do not use this Balance Harness as a restraint in a Car. 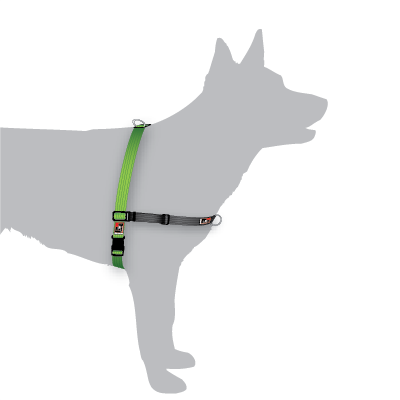 Do not use this Balance Harness with a lead longer than 2 metres.